One of the most common topics we come across in forums and online communities is the rules about how to store receipts. Do you need to keep your physical receipts for audits? If you can keep a scan, what does it need to be like? Well, in this post, we’re going to tackle the top questions about receipts and storing them digitally. Let’s talk about how many of us still have a box marked with years to keep thousands of receipts. Despite the advancements in technology, the answer is ‘many’. While some do it out of habit, there are those who do it because they aren’t sure if digital receipts will be accepted by the HMRC in the event of an audit. Two quick points to make. 1. HMRC do accept digital copies of receipts. 2. The most important thing for HMRC is that receipts are legible, and whilst digital receipts keep their form, paper receipts fade over time. These are the people who rummage through those thousands of receipts once a year, creating excel spreadsheets of their incomings and expenses before filing their tax. They set aside a good number of hours trying to organize the endless receipts or make sense of expenses they aren’t able to remember. Enter digital receipts. Because you don’t want to raise a red flag in the chances of an HMRC audit. Ditching your boxes full of receipts to a more streamlined and organized setup is every Sole Traders dream. When you’re able to search through your receipts based on categories, date and amounts, imagine how easy filing your Self Assessment becomes. While HMRC’s acceptance of digital receipts helps you get rid of all the paper you have been hoarding, there are a few things that you absolutely need to know. If you thought managing your paper receipts digitally was all about taking photos of them or scanning them and putting them into a folder on your computer, think again. You’re only going to end up sifting through digital boxes when it is finally time to file your expenses, cursing yourself for not having categorised them before. Finding the right technology to store your digital receipts is important because you don’t want to end up spending hours digging through them in case you get audited. Audits usually include asking for receipts from any time and if you don’t have them this could result in a fine from HMRC. This is where apps like 1tap receipts come handy. The app helps you store your receipts digitally by simply taking a photo. 1tap receipts then automatically extracts the date, amount and supplier, then categorises the receipt. This way all your expenses and payments get recorded in an orderly manner, making them easier to refer to at a later time. One of the most common mistakes that sole traders make while storing their receipts digitally, is ignoring the back of the receipt. So make sure that when you receive a document that has a terms and conditions printed on the back, you take a picture of both the sides, name them accordingly and store them together. When it comes to banking on technology, you should always have a backup of all your files and information. The same holds true for your digital receipts. Always back them up in the same way you’re categorising and filing them, for future reference. HMRC requires sole traders to retain all their expense records for 6 years. You don’t want to be at loss when asked to produce proof just because you lost all your data. Since you’re already storing your receipts on your computer, keep a backup on either a separate hard disk or in a cloud account. 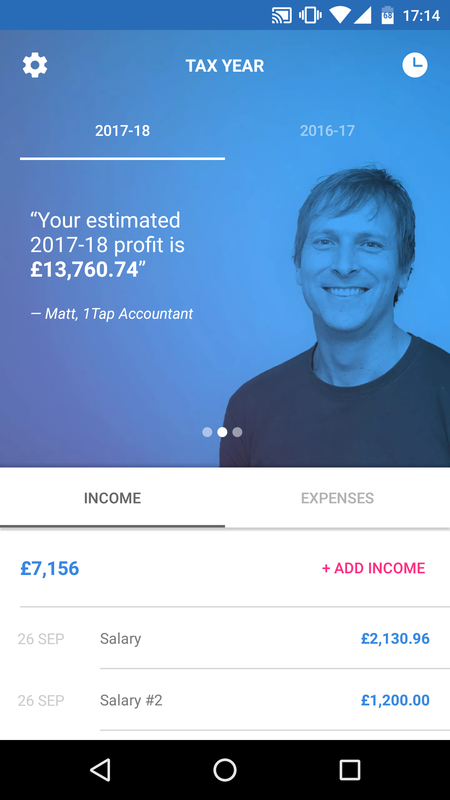 But when using products like 1tap, you can store all your receipts and invoices securely on the 1tap cloud instantly. Using the latest cloud technology with bank level security, secure backups are made throughout the day, making sure you never lose any data. While HMRC accepts digital receipts, it is important to understand that there are a few exceptions you need to keep in mind while filing your expenses. Documents received with taxes that are not VAT, need to be stored in their original format. If you’ve received them in paper format, it is time to pull out your organizers to store them. And if you have received them in any electronic format, for instance in a .pdf file, make sure you store it as it is. Don’t change the document’s format to anything else other than what you have received. You’ll be far less likely to make mistakes if you manage to get in the habit of recording expenses as you go. 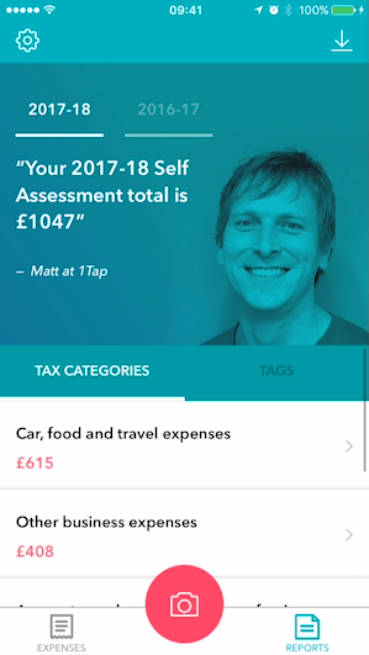 If you haven’t organised your receipts yet and are getting overworked with how many you would have to go through, what better way than to get 1tap help you out? But before you start with storing your receipts digitally, we recommend you thoroughly read through the HMRC guide on business records for sole traders. It will help you get a better understanding of what records you’re required to keep, in what format and for how long. The guide also states the expenses that a sole trader can claim returns for, saving you the trouble of storing unnecessary documents digitally. If there’s an aspect of your business that you don’t understand from HMRC guidelines, we recommend you an accountant for some quick help. You don’t want to get penalised for not having filed something in the right way or not having documents filed at all! Ditch the boxes because it’s time to move on to smarter and easier ways of filing for tax returns with 1tap.